On the ninth day of Christmas, Mother Nature gave to me…. 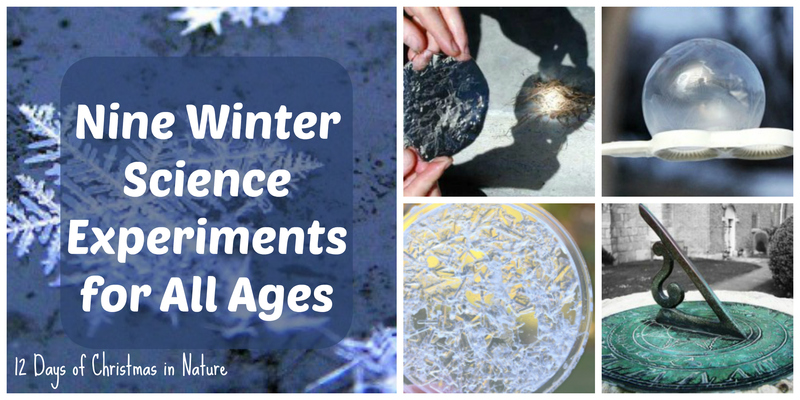 These science experiments are best done in cold weather! Some of them we’ve done before and some are new that we’ll try once it gets colder. Which ones are you looking forward to testing? simple kiddie projects. Use ice to start a fire! Read how to do it, here. The Chaos and The Clutter for a science fair project. Read how they did it! in order to conduct thorough investigations. Read more at E is for Explore! Mother Nature and Father Time team up to do some amazing things. Here are a couple ways to explore that concept. Have fun with the sun and shadows by making a sundial. Did you know there are different types of sundials? Find out how to make one, here! If you don’t already have one, this is the perfect time of year to start your nature journal. Make entries all year round and learn to observe the natural world and how time changes it. Subscribe to Trail Mix Digest for updates on the Winter Nature Journal eBook coming soon! These science projects may take a bit of crafting, digging for supplies or clean up time. I mentioned these in the 10 winter outings for family fun and here they are again! It’s because I’m excited to give these a try the next time it dips below freezing where we live. Where I live, in Georgia, we’re lucky if we get a snow day. When it’s cold, but never snowing, make your own snow! These science crafts from Babble Dabble Do are really fantastic. A great way to combine science, holiday decorating, arts and crafts! Read how to make them on Babble Dabble Do. How DO animals swim in arctic oceans and survive winter conditions? Read how to do it, here!